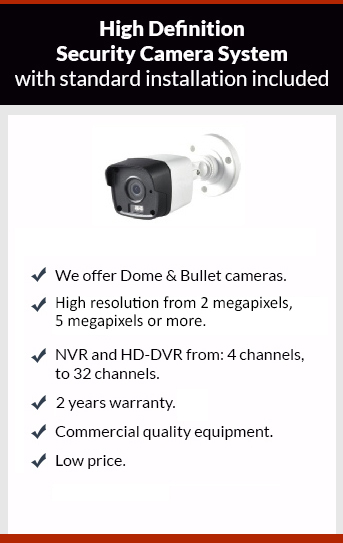 Get affordable Security Camera installation on La Palma, CA and CCTV equipment with commercial quality and 2 years warranty. Protection4less security camera equipment can do recording on the cloud: security camera can be stored on a server in the cloud 24 hours to a couple of weeks. Sometimes these cloud plans require a monthly subscription. Other option is to use a cloud service from a hard disk in a remote location. There are other options to get the data of the DVR safe in case of break in, the solution is simple just to hide the DVR and manage it remotely inside of the property. Another detail that is important in security camera system is the power back-up, if somebody cuts the power of the house the system has to run without external power. To accomplish this UPS (uninterruptible power supply) has to be installed with the security camera system. It’s really important to check this UPS at least every 6 months to verify that the battery of the UPS is working fine. Protection4less can give you several options to take care and keep safe the video recording of your security camera system, and give you the proper design of the system according to your needs. Just give us a call to check our prices, book your appointment today.